Laser Dream Works has announced they are making a line of 28mm ships. 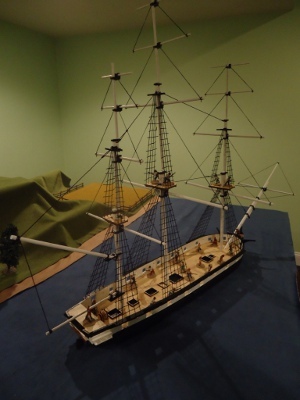 LASER DREAM WORKS is pleased to announce the first in a line of 28mm ships of the early American Navy and her foes in the American Revolutionary War and War of 1812. The first ship out of the builders docks is the Sloop of War USS Wasp.This wooden model kit is a reproduction of the 18-gun sloop-of-war USS Wasp. Built in 1807, the Wasp fought in the War of 1812. She defeated the British 22-gun sloop of war HMS Frolic, before being captured by a British 74-Gun ship of the line. She was renamed the HMS Peacock, and disappeared off the Virginia Capes with all hands. This faithful reproduction is for use with 28mm figures. The ship’s deck is 24”long and 6” wide. It’s overall length is 36” and 24” in height. The ship comes with all the materials to build the hull, masts, and yards. It does not include material for the rigging nor does it include the paint, miniatures, or terrain shown in the photos.